Halloween came and went, but there were masks aplenty at a march against the controversial bylaw P-6 on Nov. 2. About 100 marchers, including two red-nosed clowns in police uniforms who pretended to beat onlookers with plastic bowling pins, marched north from Prince Arthur St. and St. Laurent Blvd. to Mount Royal Ave. The protest was scheduled less than 24 hours before polls opened for the municipal election. “It was to remind the [mayoral] candidates that P-6 is still an issue, and that Montreal is a city where political dissent is practically part of our daily lives,” said Benjamin Gingras, spokesperson for the student group Association pour une solidarité syndicale étudiante, which arranged the protest. Amended in reaction to last year’s student strike, P-6 forbids marchers from covering their faces, and also requires organizers of a protest on public property to submit an itinerary to police in advance. The bylaw sets fines of $500 to $1,000 for a first offence. Federal law C-309 also makes it illegal to disguise one’s identity at a riot or unlawful assembly. Although ASSÉ deliberately didn’t provide an itinerary, the anti-P-6 march was allowed to continue for about two hours until it petered out at de Maisonneuve Blvd. and St. Denis St.
Police declared the march illegal over loudspeakers shortly after it began, but did not make any arrests or issue any fines. 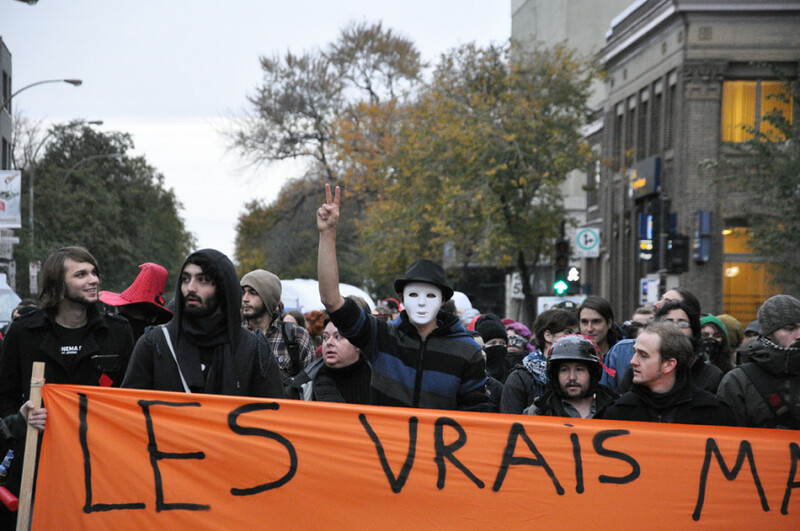 On Oct. 10, three people were arrested and 29 detained at a protest outside the Palais des congrès during the recent National Energy Board’s hearings. The marchers on Saturday were peaceful, except for a few who tore down municipal campaign posters, including those of Projet Montréal leader Richard Bergeron, who opposed the amended version of P-6 and had promised to repeal it if elected. Montreal’s new mayor, Denis Coderre, has said that he supports P-6. Many of the protesters were in costume, including a red panda, a few wearing Guy Fawkes masks, and at least one Marvin the Martian. Others simply covered their faces with a bandana or scarf. Anarchopanda, the city’s activist mascot, was at the head of the march, hugging protesters. Wearing a black-and-white panda costume as well as the red patch of the student movement, he has been on the frontlines of many local protests and has been charged four times under P-6. He joined class action lawsuits against the city to challenge the bylaw and detention conditions. But he says it may take up to two years before the matter is settled in court. “[P-6] illegitimately restricts freedom of assembly and association,” he said. “And also the fines that are given—that we might be given in a few hours—are completely disproportionate to whatever wrong we might be committing. CORRECTION: The Link originally reported that Anarchopanda hugged police officers as well as protesters. In fact, Anarchopanda didn’t hug police at this protest. The Link regrets the error.